Creation: Appeared Dec 1930 (CTB) as a renumbering of VA 302, running from VA 12 (now VA 360) west to 5 miles past US 170/VA 14 (now US 29 Bus) Chatham. A second piece of VA 57 was created as new primary routing from VA 12 (now US 58 Bus) Martinsville east 8.27 miles towards Callands. This is the only VA 57. Adjustments: In June 1931 (CTB), the Martinsville piece of VA 57 was extended east 1.66 miles. In July 1932 (CTB), the Martinsville piece was extended east 5.92 miles to the Pittsylvania line and the Chatham piece was extended 1 mile west. In July 1933, VA 57 was extended west with US 58 into Martinsville, then north with US 311 out to Bassett Forks, then replaced VA 203 west through Bassett to end at the Patrick County line. 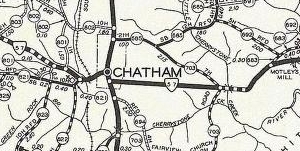 In March 1934 (CTB), VA 57 was rerouted in Chatham to use its current alignment east of US 29 Bus. Originally it had followed 29 Bus north to SR 685 east, then SR 703 southeast back to current 57. 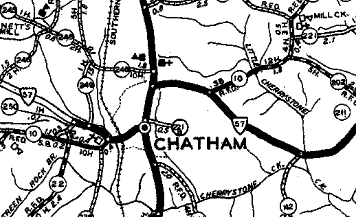 In Sept 1934 (CTB), the Chatham piece of VA 57 was extended west 6.99 miles. 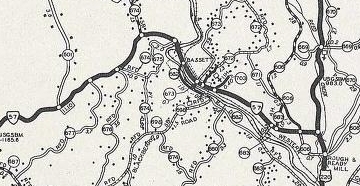 In Oct 1935 (CTB), VA 57 was made continuous when the remaining 5.84 mile gap was closed in western Pittsylvania County. In May 1943 (CTB), VA 57 was removed from SR 918 (now SR 1428) Moses Mill Rd in Chatham. In April 1944 (CTB), VA 57 was removed from SR 754 Edgewood Dr in the Bassett Forks area and instead replaced a bit of VA 57-Y to Bassett Forks before cutting west as new routing. In Dec 1947 (CTB), VA 57 was removed from SR 755 Woody Circle and SR 756 Reed Stone St in Bassett. In May 1948, the CTB turned down a request to extend VA 57 west to VA 8. In May 1952 (CTB), VA 57 east was truncated to US 29 (now 29 Bus) Chatham, leaving behind SR 832. In March 1953 (CTB), VA 57 was rerouted west of Bassett to its current Smith River crossing, leaving behind a longer, looping SR 682 and SR 666 (now also partly SR 674). 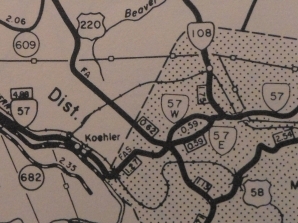 In May 1957 (CTB), VA 57 was extended west over SR 625 to VA 8. 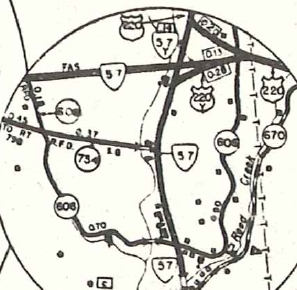 In Sept 1961 (CTB), VA 57 was removed from SR 912/687 in western Henry County. In Oct 1964 (CTB), VA 57 was removed from SR 840 Ida Loop; SR 838 Shelton Circle; SR 731 Clark Loop near Fairy Stone State Park. In July 1965 (CTB), VA 57 was rerouted in Marinsville off of Church St and instead onto current VA 457's routing in eastern Martinsville. In Aug 1966 (CTB), VA 57 was removed from SR 1154 loop and SR 1155 Hudson Circle west of Chatham. In Oct 1966 (CTB), VA 57 was removed from SR 842 Piano Rd; SR 843 Meadow Brook Loop; SR 844 Fairystone Church Loop Rd in western Patrick County. In March 1969 (CTB), VA 57 was rebuilt leaving behind several abandoned alignments from VA 41 west to Henry County. 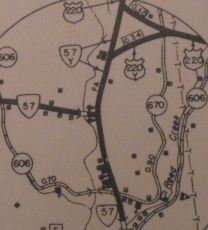 In Jan 1970 (CTB), VA 57 was removed from SR 979 Breckenridge Cir in northeastern Henry County. In Jan 1978 (CTB), VA 57 was removed from more of today's SR 754 when the current US 220-220 Bus-VA 57 interchange was completed. In June 1983 (CTB), VA 57 was removed from SR 973 Inge Dr east of Martinsville. In Jan 1992 (CTB), VA 57 was rerouted in Martinsville to its current routing via US 58 Bus and US 220 Bus. The old routing became VA 457. In Dec 2001 (CTB), VA 57 was re-extended east over SR 832 back to VA 360. In 1937 the remainder of VA 57 was paved. VA 57 was first multilaned on its Martinsville duplexes in 1960 or 1961. 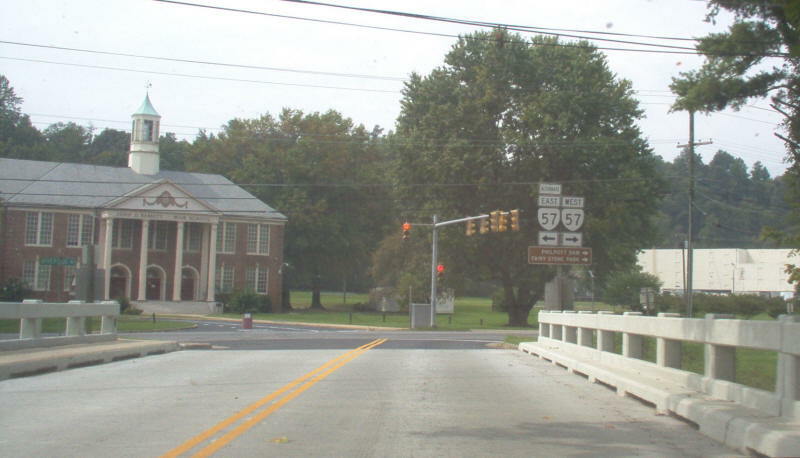 In 1964, VA 57 was multilaned between VA 57 ALT (now SR 903) and US 220. Posted: Fully posted; cutouts in the Bassett area remained until the late 90s. Legislative names: Fairy Stone Park Highway in Patrick and Henry Counties, since 3-26-46. Comment: VA 57 is much easier to drive to VA 8 than parallel VA 40 to the north. 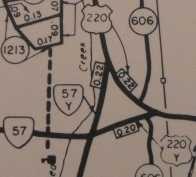 VA 57-Y: The earliest explicit reference to VA 57-Y in the CTB is March 1949, but I am pretty certain this was created in 1940 as a renumbering of a piece of US 220 in the Bassett Forks area when US 220 was placed on current US 220 Business north of Martinsville. It ran from VA 57 (now SR 734 Edgewood Dr) north to US 220, probably at the location of the end of the NB ramp from 220 Business to 220. In April 1944 (CTB), VA 57-Y south was truncated when VA 57 was removed from the E-W segment of SR 754 and put on its current route west of US 220 at Bassett Forks. VA 57-Y may have instead cut east on newly constructed road to meet US 220-Y. See the scan at right. By 1975, the intersection was configured such that 57Y only ran north-south. In Jan 1978 (CTB), VA 57-Y was decommissioned (destroyed) when the current interchange at US 220/220 Business/VA 57 was built. Creation: Appeared Nov 1957 (CTB) as an upgrade to SRs 682 and 683, running from VA 57 Bassett east along the Smith River, then cutting north back to VA 57 at Stanleytown. Adjustments:In Aug 1980, the CTB rejected a request from the Henry County Board of Supervisors to extend VA 57 ALT further east over SR 682, SR 683, and SR 609 Field Ave across Smith River to end at VA 57. The CTB studied this extension in 1976, 1978, and 1980 before concluding it would not do so. In May 1981 (CTB), VA 57 Alt was rerouted to its current end at US 220 replacing a little more SR 682 plus new construction, leaving behind SR 903. Posted: Fully posted; numerous cutouts in the Bassett area remained until the late 90s. A single set lasted to 2006 at SR 698 EB but is gone in Google Street View from 2009. Comment: VA 57 ALT did not appear on state official maps until 1977. VA 57 ALT is mostly posted as 57A in shields instead of the ALTERNATE banner posting that these routes have traditionally had in Virginia.